Veteran L.A. reedman Gary Herbig leads this eclectic program of original songs. bringing a comfortable mainstream radiance to the forum. With different bands in his line-up. he's paired double bassist Luther Hughes with drummer Paul Kreibich, double bassist Pat Senatore with drummer Alex Acuna, and electric bassist Dan Dean with drummer Mike Jochum, while he and pianist Stu Goldberg drive the session with passion. Others sitting in with the seasoned saxophonist include bassist Reggie Hamilton, guitarists Jay Leach & Laurence Juber and vibraphonist Tom Collier. Everyone puts up a good solid front in support of Herbig's latest CD release. The album's title refers to Herbig's birthplace. From a family of professional musicians, he grew up on a 40-acre ranch at the foot of Patte Canyon in Montana. where he studied clarinet and joined the musician's union at age 14. After attending the University of Montana on a clarinet scholarship, he arrived on the L.A. jazz scene in 1969. working with local bands and doing studio work. There aren't many bandsmen around who can sit down with you and discuss their experiences with the big bands of Don Ellis. Toshiko Akiyoshi, Gerald Wilson, Buddy Rich and Percy Faith. Herbig is one of those guys, however, who'd rather play the music than "toot his own horn." Fortunately, he did receive an honor last year: a lifetime achievement award from the University of Montana. Herbig and pianist Goldberg put a heartfelt touch into this session that makes it smoke like the blues. Herbig plays flute, soprano sax, alto and tenor in a program that ranges from straight- ahead jazz to Latin and contemporary. His sidemen get plenty of solo time, while his flute and saxophones bring a welcome shine to the session. There's something here for everyone. 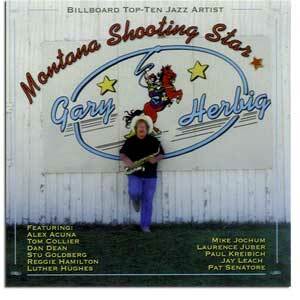 Herbig's album is available at www.garyherbig.com or by mail from Gary Herbig, P.O. Box 530. Sherman Oaks, CA 91423.